To use this handy new feature, you need both an iOS 12 device and Mac running Mojave. There are two options when using Continuity Camera; inserting a photo or a scan. When inserting a photo, it looks just like a photo that would be snapped on the phone. Scans, on the other hand, get converted to grayscale and flattened, looking just like it was uploaded through a scanner. Many apps on Mac work with Continuity Camera including Pages, Keynote, Numbers, Notes, Bear, TextEdit and many more. To get started, open a document in an app that supports the feature. Right click and select Insert from iPhone. Now choose between Take Photo or Scan Documents. When shooting a photo, you will have the option to retake it if it does not look right, and when scanning, you will have the option to add additional pages to the scanned document. Scanning also lets you change the filter of the document, including greyscale, black and white, color, or photo. 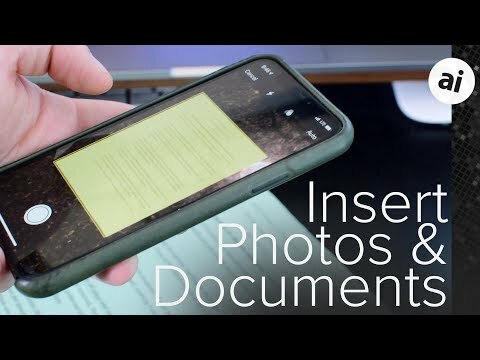 Users have been able to scan documents on their iPhone and iPad since iOS 11 using the Notes app, though Continuity Camera takes that feature to a new level. This looks like a great feature. Will it work, I wonder, on all macs capable of running Mojave and all iPhones capable of running ios12? It's a nice feature, but would be more useful if you could choose from the camera roll as well as taking a fresh photo. Still very nice though. If you have iCloud activated for photos, anything on the phone's camera roll will also be in the Photos app on your Mac. You can just drag-and-drop from there. You can also use Airdrop to pass photos from your phone to your Mac.